Increasingly desperate shouts of “C’mon!” punctuates each chorus of Love Will Tear Us Apart, as New Order reach the end of their first Australian concert in 11 years. Front man, Bernard Sumner wants us to show him exactly how much we love the song and how much we’ve missed his band. His enthusiastic cry is stunning and muscular, as it may well be. After all, Joy Division’s swan song will forever be a significant marker in New Order’s career. But their set tonight is nothing but continual proof of how much the band achieved subsequently, and is presented as a chance for them to share every mile stone – beautifully framed and hung - with their unwavering supporters. The framing in this case is the fascinating visual projections accompanying each song. Film producer Michael Shamberg and graphic artist Peter Saville gave New Order’s music a very specific identity and here these songs and images combine to transport us to the heart of the Hacienda dance floor, sometime in the mid-1980s. The band manage the near impossible and deftly shift the atmosphere in Festival Hall like some alien race adapting its environment after a hostile take over. Resistance is not an option worth entertaining either. 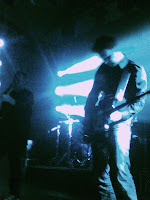 “Sorry about the weather…” Sumner apologises at one point, ”it feels a lot like home tonight.” As the words leave his mouth, vintage video footage of the band playing an early show in the actual Hacienda suddenly fill the screen, and they launch into a “never played live before” Here To Stay. 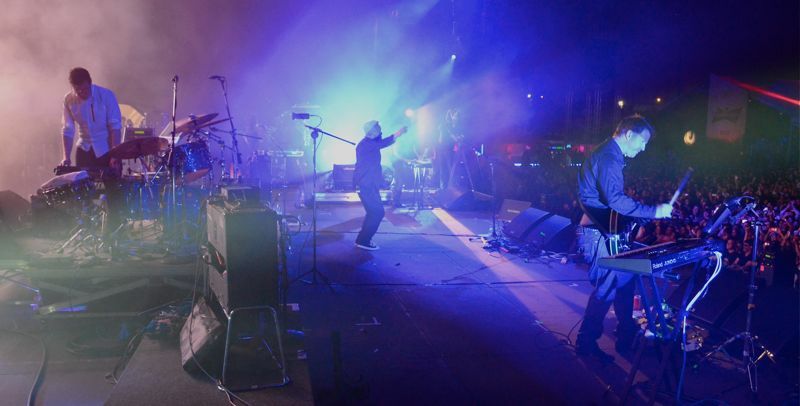 The film, 24 Hour Party People told the whole story of the Hacienda’s importance to the Manchester scene; but the venue had significance enough for New Order to be immortalized in song. New Order’s true celebration of their past begins at this point - albeit in reverse order - but then there are also those bits of their past they’d rather soon forget. 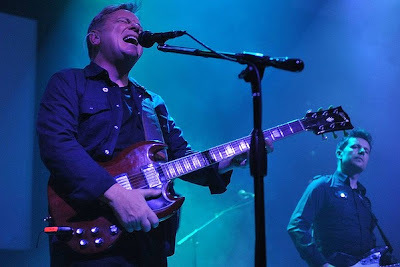 In all the pre-tour media, as expected the focus was on matters of new band members (bassist Tom Chapman and guitarist Phil Cunningham) and the absence of Peter Hook. Its hardly the elephant in the room, but Sumner addresses it all the same tonight, “Oh look, we’ve got a new base player... How about that?” We cheer and welcome the slightly altered line-up, and if any Hooky die-hards are here tonight, they’re keeping pretty quiet. Chapman (Hook’s stand-in) chugs through the set with all the precision and fat riffs the songs were built on, smashing any worries that ‘it wouldn’t be the same without him’. There are plenty more standard New Order-isms in place to distract from the absent Hook and his famous low-slung bass stance anyway. A recently returned Gillian Gilbert is frozen behind her keyboard, serenely jabbing out those renowned melodies in apparent deep concentration; the very picture of familiarity. Sumner is bopping his head, eyes closed as he sings into a mic held delicately by one hand; as all images of him in concert will support. These details, along with a distinctly retro light show bring so much warmth on this wet, drizzly night. The set is packed with carefully chosen ‘signature hits’ from start to finish, but the strong start – Elegia, Crystal, Regret – sees only sporadic pockets of dancing from the cross-generational crowd. It’s True Faith at the midway point that finally brings the crowd to full, pulsing life, while Bizarre Love Triangle starts the closest thing to a mosh pit seen all night. It’s during this track I notice members of System Of A Down watching motionless from the side of the stage, casually chewing bubble gum, perhaps even harbouring a little envy after their own lackluster Soundwave sideshow show the night before. 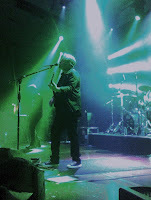 New Order, despite being a much older band, never sound tired or careless with the material. Sumner’s never been the most powerful vocalist, but following a fantastic 1963, he gives himself a mental pat on the back for striking ever note. “That was the best one so far tonight, I think.” He grins. The audience might argue that point though – Temptation as with True Faith is a clear favourite, still sounding incredibly fresh at 31 years-old, although it takes a good minute to become familiar. Many of the older tracks have been sharpened up, extended and even remixed with the help of some sweet advances in live electronic music re-creation, but the focus never really drifts too far from the ‘live band’ sound. 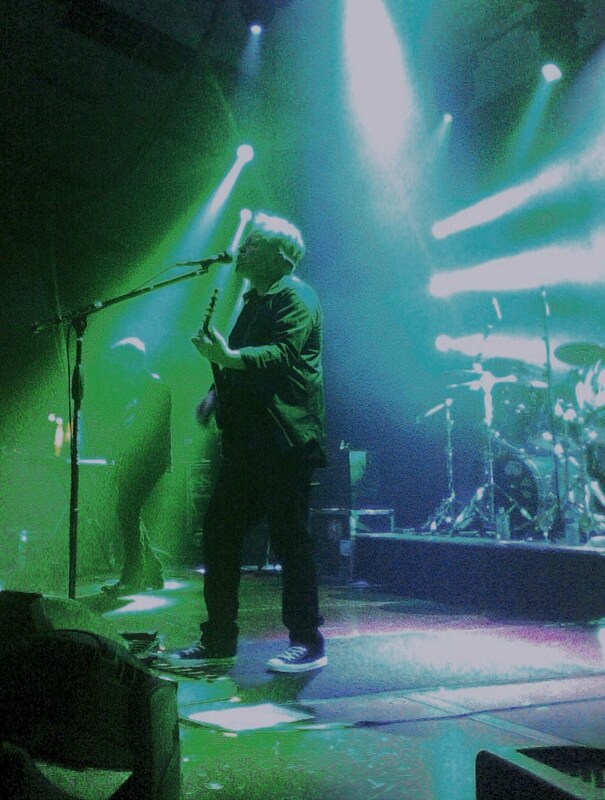 They are going to close with you-know-what, but after a brief exodus, New Order return to the stage in silhouette for an encore which is still loaded with expectations. Blue Monday’s juddering beats begin from out of nowhere. The stage is in darkness except for an animated orb roving around the drop screen, and on cue, the audience clap in time. Sumner finally emerges to join the others, just as his vocal part is scheduled to begin and blue light saturates every corner of the hall. For the moment I’m all goose-bumps, and believe me it’s not cold in here. Blue Monday’s in-concert life actually began in Australia on the band’s 1983 tour where it was first ‘road tested’. I can’t help thinking its debut was a huge hit with local crowds even back then, otherwise would we even be chanting its haiku-like verses three decade later? Thanks to things such as setlist.fm, we knew there was no second encore coming, so the final applause seemed unfittingly brief. Having grown up knowing New Order’s later material first, I was still left with the feeling that this was as authentic an experience of a ‘classic New Order show’ as anyone could want. Maybe they’re a few kilos heavier, and they’ve tidied up their sound and lost a member or two, but nothing about this concert spelled desperate last stab at relevance. If anything, the celebration of their musical history was indicative of a bright future at a stage in their career where there is no certainty at all beyond this tour. Here’s hoping the show was as good for them as it was for us and it isn’t long before we get to party with New Order like its 1989 all over again.